Digital participatory media offer urban social studies teachers a unique opportunity to foster students' civic skills and public voice while enhancing their understanding of social justice within a democratic society. This article addresses the continuation of a New York City 8th grade U.S. history teacher's journey to use digital tools to foster his students' collaborative and communication skills and to help them learn social justice oriented content. While doing so, he overcame challenges related to technology integration, curricular alignment, selection of appropriate digital tools, and the need to cultivate his students' online academic norms. In doing so, he confronted Livingston's query about whether the use of technology necessitates a “fundamental transformation in learning infrastructure” and the need “to rethink the relations between pedagogy and society, teacher and pupil, and knowledge and participation” (2012, p. 8). He ended this part of his journey with these new challenges: how to enable his students to become navigators of their learning; ways to align the curriculum with his students' thinking; and, managing a dynamic instructional support system guided by his students' learning. His goal is “to forge a bridge between [his students'] media production and civic engagement' (Kahne, Lee, & Feezell, 2012). The use of digital tools to develop a public voice on social justice themes is becoming more and more critical for middle school teachers for two reasons. First, rather than seeking out diverse perspectives, when using social media adults seem to gravitate toward like-minded people. According to Hampton, Rainie, Lu, Dwyer, Shin, & Purcell, (2014), for example, when they surveyed adults about their willingness to discuss the Snowden-NSA story, 86% of respondents were amenable to discussing the surveillance program face-to-face but only 42% of Facebook or Twitter users were willing to do so on either platform. Respondents were much more likely to engage in both a face-to-face and online discussion if they realized that others agreed with them. While online forums provide people with multiple opportunities for ongoing deliberations about public policy matters, adults seemingly are reluctant to take advantage of them. Second, a troubling effect of No Child Left Behind is the decline of instructional time for elementary social studies (Heafner, & Fitchett, 2012; Fitchett & Heafner, 2010; Boyle-Baise, M., Hsu, M. C., Johnson, S., Serriere, S. C., & Stewart, D., 2008; Center on Education Policy, 2008; Vogler, Lintner, Lipscomb, Knopf, Heafner, and Rock, 2007; and, Van Fossen, 2005)1. This situation is particularly acute for those in high poverty districts (Pace, 2008, 2011; Befiore, Auld & Lee, 2005; Roth, Brooks-Gunn, Linver, & Hoffereth, 2003)2, which means the students most in need of learning how to become civically engaged are the ones least likely to do so. 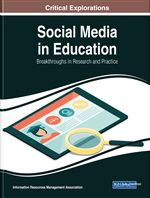 Urban middle school teachers must discover and cultivate ways to use online social media to foster students’ “public voice” so as “to forge a bridge between media production and civic engagement” (Kahne, Lee, & Feezell, 2012, p. 3). One way to do so is for students to address social justice issues in an 8th grade U.S. history course as they interact with each other and with students from Midwestern rural and suburban districts via social media platforms, which requires an instructional support system for technology integration and a teacher capable of doing so.